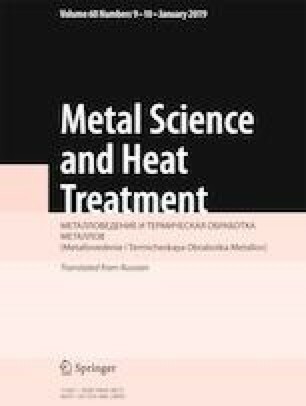 The effect of the structural transformations during non-vacuum electron-beam cladding of amorphous boron powder on the hydroabrasive wear resistance of the surface layers of a chromium-nickel austenitic steel is studied. It is shown that the cladding yields a coating with densely arranged borides. An x-ray method is used to show that the modified layer consists virtually fully of Fe2 B iron borides. This structure raises the hydroabrasive strength of steel 12Kh18N9T by a factor of 1.5 – 2. Translated from Metallovedenie i Termicheskaya Obrabotka Metallov, No. 10, pp. 26 – 30, October, 2018. The work has been performed with financial support of the Russian Federation via the Ministry of Education and Science of the Russian Federation (Agreement No. 14.610.21.0013, Project Identifier RFMEFI61017X0013).